Chili cookoff on Sunday, originally uploaded by captainjay. 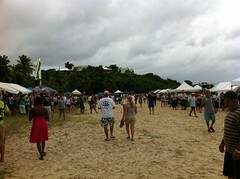 If you're on island come by Brewers Bay beach (UVI) on Sunday from noon to 6 pm. Fun times!! Btw- pic is from last year chili cookoff when we had TS Irene come thru. Say goodnight Irene!